A year ago, a great flock of a dozen bluebirds flew into our yard for the day, the Sunday just before the cold spell returned. We delighted in their flitting from tree to grass and back to tree, blueness flashing by. 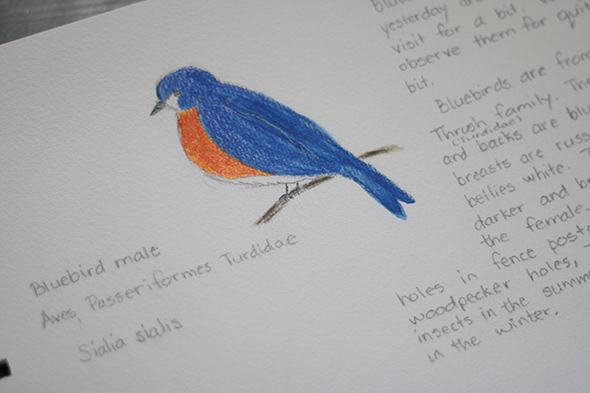 I got out the Handbook of Nature Study and started reading a bit about the bluebirds to the kids. Then I read to them from chapter 5 of The Burgess Bird Book. 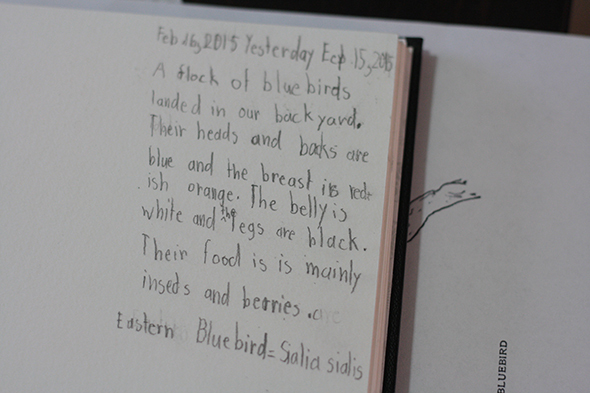 The next day, instead of starting with math as we usually do, I had the nature journals ready. 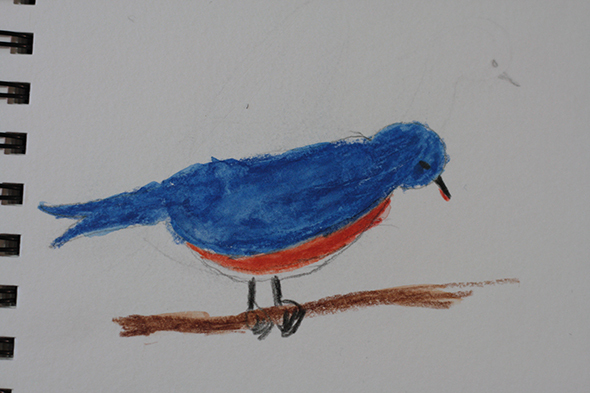 After Morning Time, I announced boldly, “I am going to paint a bluebird so I can always remember yesterday.” I plunked myself down at the dining room table where we do school and proceeded to sketch my bluebird. I had taken the color image and the coloring image from this page, and had arranged them to make a single coloring page in a Word document. I used one of the bluebirds from there as my guide. The kids sat with me and started coloring their coloring pages. The criteria was to color them identically to the model. It was interesting how Bear (7) took this to heart and tried out a bunch of coloring pencils to get the hues to match exactly. I showed her how you can layer colors as you color. She liked that. 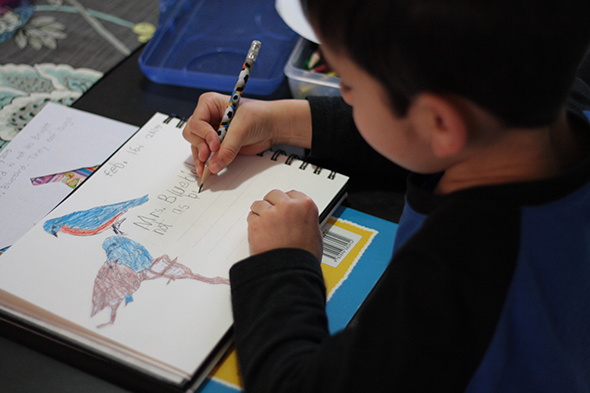 Then J-jo (5) declared he was done and I asked him if he wanted to draw and paint a bird in his sketchbook. Of course he did not. So we compromised and he cut out the birds from the coloring page and glued them into the sketchbook. I cringed a bit at wasting a perfectly great page of watercolor paper! (We use these beautiful, sturdy books.) 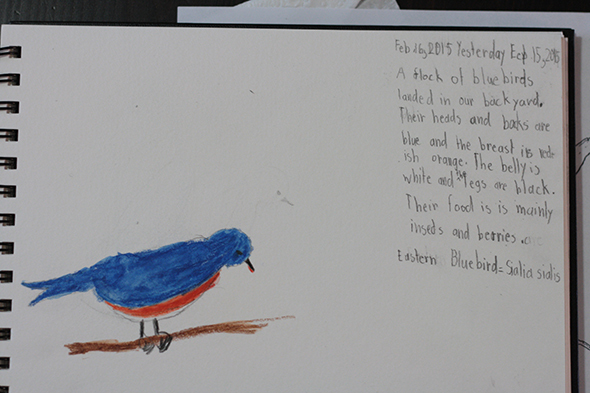 Bear meanwhile did decide to paint a bird and wrote quite a long entry about the bluebird. It helped that she saw me write more than usual. We started our journals exactly two years ago and they are barely filled. My goal is to make sure we do some sort of keeping in them weekly, even if the weather does not cooperate. I have been inspired by these daily nature study plans and am trying to bring nature inside more often as a compromise. It’s not my ideal, but it is better than not doing nature study. What does nature study in your home look like? Thank you, Celeste! It is so rare to see them here in the quantity we saw them. I need to remember to model good keeping. It doesn’t happen as much as I would like. It usually is, “Time for nature journal. Come sit down!” That’s not a very welcoming invitation, even if I always join in on the nature journaling. Thanks for sharing, Julie. Sounds like a very successful Nature Study in my book, and the drawings look great! In our home, we are always noticing or seeing things as we live out of town and have easy access to the natural world. This doesn’t always translate into ease-of-journaling however. Recently I have been trying to jot down things the kids and I have seen while out and about, then on our journaling day I mention them as ideas for inclusion. I too am trying to keep up with a weekly keeping habit in this subject. Hope your past few weeks have gone well!